Today is day three of Banned Books Week, and I’m featuring a controversial book each day to celebrate. Today’s book is The Handmaid’s Tale, by Margaret Atwood. 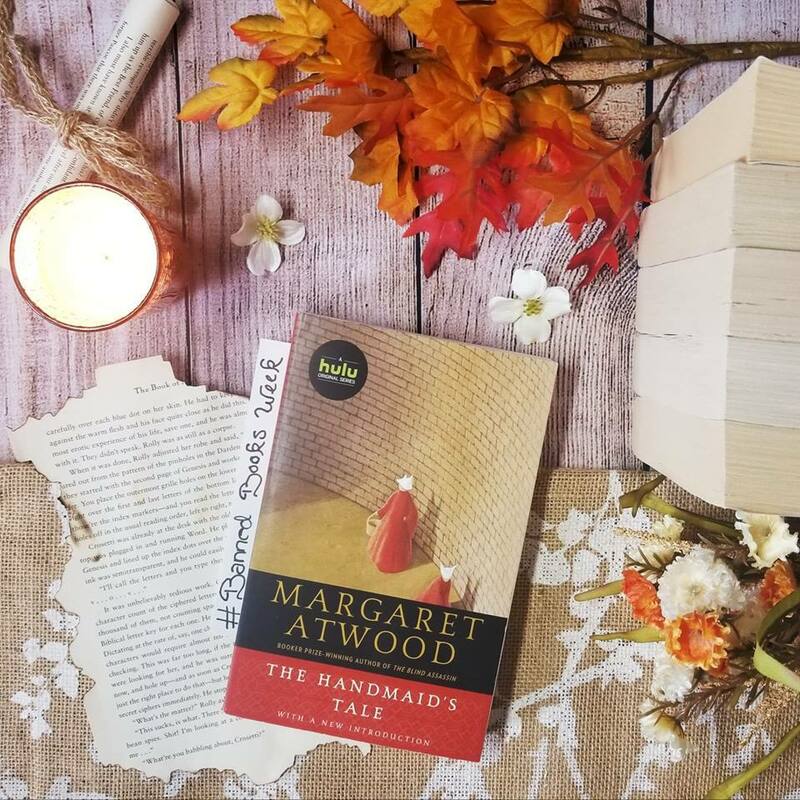 Margaret Atwood’s The Handmaid’s Tale is a feminist classic. It features a dystopian America with a bleak look at what could come of a fertility crisis and a male-dominated, hyper-conservative society. This novel is a particularly frightening dystopia due to its believability. The Handmaid’s Tale has been banned for its ostensibly anti-Christian themes. The Handmaid’s Tale features women in a variety of roles, while they are all under the thumb of Gilead in one way or another. Offred has relatively little privilege as a Handmaid. Comparatively, to what extent would you consider Wives or Aunts to be victims in Gilead? Discuss in the comments! Spoilers for The Handmaid’s Tale (both the book and the TV show) are ahead, friends. Continue at your own risk. The van waits in the driveway, its double doors stand open. The two of them, one on either side now, take me by the elbows to help me in. Whether this is my end or a new beginning I have no way of knowing: I have given myself over into the hands of strangers, because it can’t be helped. Full disclosure: one of my favorite things about the novel The Handmaid’s Tale is the ending. Perhaps this impacts my perception of the television adaptation negatively. I love the ambiguity of book Offred’s fate, followed by the jarring shift to the “Twelfth Symposium on Gileadean Studies,” where we are treated to a transcript of Professor Pieixoto’s speech. We have spent around 300 pages immersed in Offred’s story, feeling her pain and simmering resentment, hoping against all hope that she will escape. We are denied the closure of knowing what became of her. If I may be permitted an editorial aside, allow me to say that in my opinion we must be cautious about passing moral judgment upon the Gileadean. Surely we have learned by now that such judgments are of necessity culture-specific. Also, Gileadean society was under a good deal of pressure, demographic and otherwise, and was subject to factors from which we ourselves are happily more free. Our job is not to censure but to understand. This endorsement of moral relativism is, in context, quite absurd. It makes the assumption that the people of Gilead made the decisions they did because they had no better options, or simply didn’t know any better. Offred’s words painted a very different picture over the course of the book, however. Gilead was an anomaly on a worldwide scale. Other countries, we are forced to assume, found a better way, without resorting to the horrors that befell Offred. Pieixoto’s own speech makes reference to another country banning birth control (a human rights issue, to be sure, but not on the scale of Gilead’s crimes) and providing financial incentives for giving birth. This bears the question: What is Gilead’s excuse? More generally, both in The Handmaid’s Tale and in real life, historical instances of one group standing with their boot on another’s group’s neck are often met with empty platitudes about how “people didn’t know any better back then.” I think it is quite obvious that the group with someone’s boot on their neck was always quite aware of the moral injustice; they always knew better. It is disingenuous to assume that the dominant group was incapable of the same. So, how does all of this tie into the Hulu adaptation? By continuing past the first season, the TV version of The Handmaid’s Tale has removed some of the ambiguity. While the existence of the journal entry recording those final moments with Offred means it is safe to assume that Offred wasn’t immediately killed by Gilead agents, even if she spent time rotting in prison before being executed, one cannot rule out the possibility that she managed to pass on her final entry to a sympathetic person in the hopes that her story would survive. Offred, despite the academic dissection of her words, was ultimately lost to history. The lack of knowledge of her fate was thematically important to the story, in part because Offred could represent so much more than herself. She was treated as a cog in the machine by Gilead, interchangeable with any and every other Handmaid. Offred’s story is personal to us because we have been allowed access to her individual experience. There was nothing inherently more special or tragic about her compared to any of the other Handmaids. Ultimately, the ambiguity in Offred’s fate makes a point: it doesn’t matter whether Offred lived or died, when countless Handmaids died in silence, their stories forever snuffed out by the brutality of Gilead. Offred may well have made it out of Gilead alive, but we know that many Handmaids did not. Each of them would have had a history and inner life as vivid as Offred’s. Atwood’s Gilead is, of course, fiction, but as she has stressed over and over in interviews, she didn’t truly make any of it up. All of the things which happen to women in Gilead are based on things that have been done to women throughout history. Offred is, in a way, a voice for all of them, whether they survived or not. Endings tend to be one of the most thematically rich moments of a story. Where the author chooses to end things can speak volumes about everything that came before. When an adaptation chooses to continue a story past the moment the author originally said it was done, something is inevitably lost. However, perhaps The Handmaid’s Tale is less guilty than other adaptations; after all, Atwood works as a consulting producer for the show. She is, of course, the ultimate master of Offred’s fate. And as much as I loved the ending of the novel, now more than ever, we need to see stories about women surviving… and fighting back. And I’m grateful to Offred June for that. Thanks for reading! Please feel free to share your thoughts on this topic in the comments! Let’s discuss!